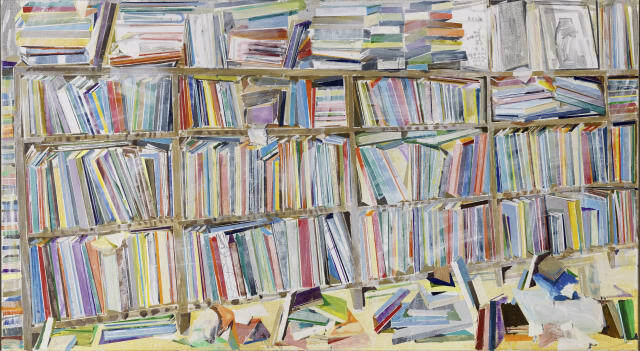 BOCA RATON, Fla.—Thomas Hartmann: Summer Reading, an exhibition featuring book and library-themed paintings by contemporary German artist Thomas Hartmann is now on view through Aug. 5 in Rosenbaum Contemporary’s Boca Raton gallery, 150 Yamato Road, Boca Raton, Fla.
Hartmann explores the tension between order and chaos in his work. Some of his common themes are urban and panoramic landscapes and choreographies of human gatherings as well as stacks of books and papers and library rooms crammed full of books. Hartmann has received several awards including the Overbeck Prize for Fine Arts; the Art Prize for Artists of Düsseldorf, Germany; and the Willi Oltmanns Prize for Painting, Delmenhorst. His work has been shown throughout Europe and the United States in numerous venues including the Solomon R. Guggenheim Museum in New York, the Toledo Museum of Art in Ohio, and the National Library in Warsaw, Poland, among others.